Last week had some good matchups on paper. This week, not so much. Only one game where I wasn't confident with my picks. Bemidji State at Wayne State - Bemidji gave Duluth their first real game of the season last week. Wayne got throttled by Concordia. I'm thinking Wayne comes out fired up and plays a more competitive game at home, but they just don't have it in them this season to beat one of the better teams in the league. Minot State at Sioux Falls - Since both teams moved from NAIA to D2 together back in 2012, Minot always seems to play USF tougher than anyone else. Not sure why. That being said, USF coming off a big win last weekend and having a big game at Bemidji the first weekend in October, this has all the makings of a trap game (case in point, Minnesota Vikings yesterday.) I still think the Coo walks away a couple of scores ahead, but I wouldn't be surprised if the red Beavers come out and play a pretty competitive half of football before USF gets their head on straight. Augustana at Minnesota-Crookston - Augie didn't play to their potential last weekend. Crookston played above their potential last weekend. I think the Vikings bring everyone back to reality. Concordia-St. Paul at Minnesota-Duluth - I'm interested to see this one. A year ago I would have said this game wouldn't even need to be played. I still think Duluth easily wins but I think the Golden Bears will make the Bulldogs work a little harder for it this time around. Southwest Minnesota State at Mary - Right now it looks like Mary has claimed Crookston's crown for the bottom of the NSIC. I wouldn't be surprised if the Mauraders wind up 0-16 this season. St. Cloud State at Minnesota State-Mankato - Some history here will give the Huskies a score or two, but the Mavericks won't be challenged at home. Winona State at Northern State - After dropping two games in a row the Warriors will be hungry for a win. The Wolves will probably win another game or two this season, but this week won't be one of them. Minnesota State-Moorhead at Upper Iowa - Hardest game for me to pick. These two teams seem to be fairly evenly matched. A lot of it will depend on which Peacock team shows up: the one that beat Winona and scored heavily on Augie, or the one that got destroyed by Concordia and barely scored against SMSU? I think Moorhead has been the more consistent team this season, so right now I've got them getting an upset on the road. Last edited by Tundra_Man; 09-27-2018 at 02:08 PM. Minnesota State-Moorhead at Upper Iowa - Hardest game for me to pick. These two teams seem to be fairly evenly matched. A lot of it will depend on which Peacock team shows up: the one that beat Winona and scored heavily on Augie, or the one that got destroyed by Concordia and barely squeaked out a win against SMSU? I think Moorhead has been the more consistent team this season, so right now I've got them getting an upset on the road. Winona is one of the few teams I haven't seen this year. Despite being Gypsy Days the Wolves would need to play flawless, catch some breaks and that may not be enough. Certainly will need more than the 140 yards of offense we had last week. 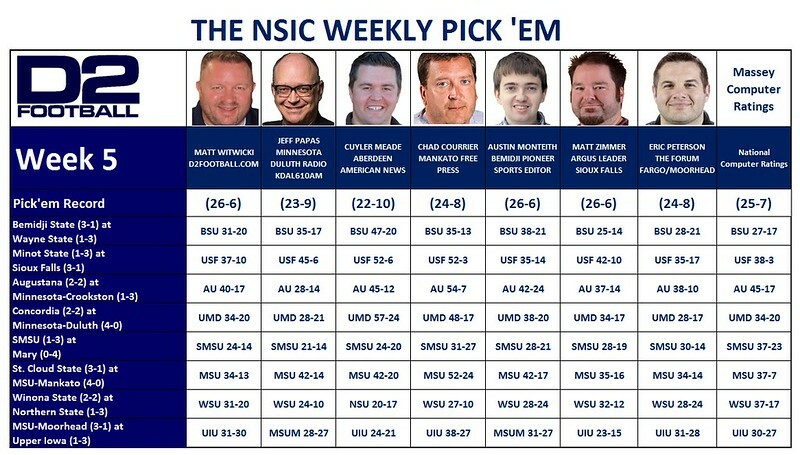 It's the NSIC, so of course it could happen but I am not going to count on it. Hoping the young Wolves can just continue to grow and make some plays and keep it from a blow out. Gypsy Days is crazy busy and fun and is always the highest attended game in the NSIC each year. However, it will be fun regardless as we have gotten use to heartbreak. Bemidji State at Wayne State -- State Bowl. I can state that Bemidji wins, won't require 2 OTs to get there. Minot State at Sioux Falls -- Once NAIA Bowl. Why not Minot? Because Sioux Falls is way better. Note to Red Beavers--visit the falls after the game, I was just there and the water is running high. Like the Coo's point total. Augustana at Minnesota-Crookston -- Arctic Circle Post Stunning Win Bowl. Lutherans, all day and in every way in muddy Crookston stadium (aka, The Uncovered Dish.) Vikings D1 talk starts over at Crookston. Take THAT sentence in. Concordia-St. Paul at Minnesota-Duluth -- Minnesota Hyphen Bowl. Which version of which team will show up? One-of-a-kind, hard-to-say pick-of-the-week game. Southwest Minnesota State at Mary -- The Defense Free Bowl. I'm watching this on live stream, it'll be a four-hour, 66-60 four quarter score. Mary Coach Craig Bagnell inserts himself in the game by fourth quarter as QBs run out of gas. St. Cloud State at Minnesota State-Mankato -- The Conceived While Smoking Dope Bowl. Mavs all the way. The Classic Traveling Training Kit game is a far cry better than the original suggestion, Jumbo Jockstrap "Cup." Note--still waiting on first Bemidji-Minnesota-Duluth Deer Carcass on the F250 Hood Game. Minnesota State-Moorhead at Upper Iowa -- The Sounds Like a Minor League Baseball Mascot Bowl. Dragons v. Peacocks. Get some cheap 'dogs and beer, this is going to be a close slugfest on Fayette's own Fields of Dreams. Winona State at Northern State -- State Bowl Part 2. Winona might edge Wolves (I'm torn), but it won't matter unless Winona bus starts out Wednesday for the long drive--Warriors have to get that head start because they fade in the second half. That's a Mav joke. Wind says only 13 mph in Aberdeen on Saturday...also, well done on this. And yes, the Gyps will be howling!! Ahh, but you forgot the Swisher Wind Conversion Ratio. 13 mph translates to roughly 437 mph at the Swish. You are correct, I forgot all about that! This weekend MSU and SCSU battle for the Training Kit trophy. The two teams don't play each year anymore, but it still is a prize. I look forward to these every single week. I lost it at "Coach Craig Bagnell inserts himself in the game by fourth quarter as QBs run out of gas"
Tacky. Reminder posters: Don't lower yourself to mock your opponent. Might not be today or tomorrow, but someday that bite in the a** is gonna be painful. Just as a minor point of clarification, Quentin is a Mankato fan so technically Minot is not his opponent this week. Does't matter. It was a cheap shot. Some of these ad nauseam game-by-game chat posts are...have a nice day genuine. Years ago there were a lot of posters who slammed teams other than their own. Even players...and by name! After awhile they left, graduated, had families and are now, I imagine, slammin' day care providers and nursery school personnel. Anyway, now the occasional ones comparin' waterfalls to a team's scorin' prowess and superiority are equally lame, juvenile and sophomoric. jmo. Good luck to you and your team. Have a nice day. Last edited by Clean Liver; 09-27-2018 at 06:28 PM. Point taken. Though I do think you need to lighten up a bit. Last edited by Quentin44; 09-29-2018 at 09:09 AM. Game day! Heading over to the Bob in a couple hours. Can't wait. I don't believe in bad-mouthin' other teams, postin' ludicrous scenarios or name-callin'. Just like I don't believe coaches get anywhere by yellin' or cussin' out a player on the sideline. Embarrassin', imo, to the poster, coach and player. Bemidji State at Wayne State - I think Bemidji will win this game. Minot State at Sioux Falls - I think USF will win this game. Augustana at Minnesota-Crookston - I think Augustana will win this game. Concordia-St. Paul at Minnesota-Duluth - I think Duluth will win this game. Southwest Minnesota State at Mary - I think Southwest will win this game. St. Cloud State at Minnesota State-Mankato - I think Mankato will win this game. Winona State at Northern State - I think Winona State will win this game. Minnesota State-Moorhead at Upper Iowa - I think Upper Iowa will win this game.